Whenever someone gets hurt or experiences trauma, it’s usually quite clear when it’s an emergency that needs to be addressed immediately. However, when it comes to dental emergencies, many people don’t know what to do or even know if what they’re experiencing constitutes as a dental emergency. This can cause them to visit the hospital when they didn’t have to. Even worse, it could prevent them from seeking treatment right away, which is typically necessary to save a tooth. The next time you experience a dental injury, keep these points in mind. It could mean the difference between saving your tooth and needing a dental implant or bridge later. If you minimally chipped your tooth and don’t experience much pain, then you can wait until your dentist is open during regular business hours. Just be sure to call regardless to get advice and schedule an appointment. If a tooth is knocked out or broken, you’ll need to take care of it before you visit the office. If the tooth is knocked out, locate the tooth and only pick it up by the top part (crown.) Avoid touching the root of the tooth or removing any gum tissue that may still be attached. Use clean water to clean the crown and try to place it back into your socket if still in one piece. If this cannot be done, place the tooth in a sealed container of milk, a mild saltwater solution, or saliva if neither are available. If your tooth has become dislodged but still remains in the socket, use a cold compress to reduce facial swelling and take ibuprofen or acetaminophen to reduce pain. Use gentle pressure to push the tooth pack into place. Never use heavy force to put it back. If you ever experience heavy bleeding or you think your jaw is broken, go to the emergency room first. This way, your dentist can more easily treat your dental emergency. 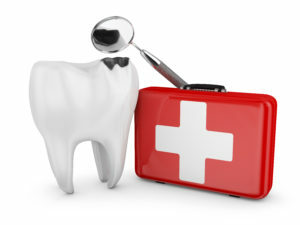 Once you’ve finished getting care at the hospital, visit your dentist as soon as possible! Dr. Alex Martin earned his Doctor of Dental Surgery degree at Creighton University of Omaha and has become a member of organizations like the ADA, and the American Academy of Cosmetic Dentistry. He’s fully capable of offering a variety of dental services, including cosmetic services to rebuild your smile after treating you for your accident if necessary. To learn more about these services or handle a dental emergency you’re currently experiencing, contact him at (480) 860-1993 or visit his website.